Objective To estimate the effect of adding exercise classes, spinal manipulation delivered in NHS or private premises, or manipulation followed by exercise to “best care” in general practice for patients consulting with back pain. Design Pragmatic randomised trial with factorial design. Setting 181 general practices in Medical Research Council General Practice Research Framework; 63 community settings around 14 centres across the United Kingdom. Participants 1334 patients consulting their general practices about low back pain. Main outcome measures Scores on the Roland Morris disability questionnaire at three and 12 months, adjusted for centre and baseline scores. Results All groups improved over time. 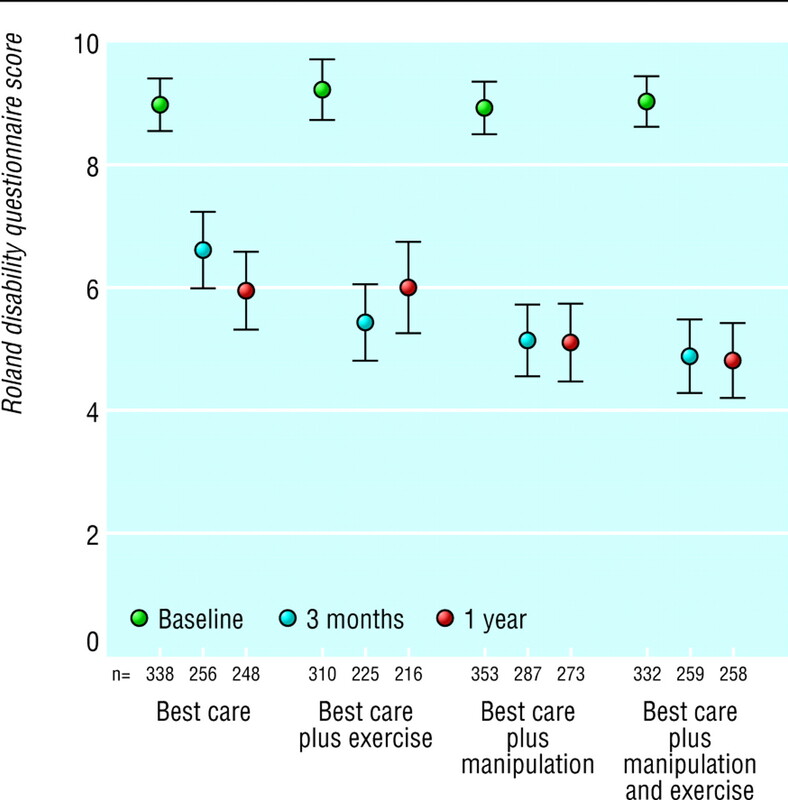 Exercise improved mean disability questionnaire scores at three months by 1.4 (95% confidence interval 0.6 to 2.1) more than “best care.” For manipulation the additional improvement was 1.6 (0.8 to 2.3) at three months and 1.0 (0.2 to 1.8) at 12 months. For manipulation followed by exercise the additional improvement was 1.9 (1.2 to 2.6) at three months and 1.3 (0.5 to 2.1) at 12 months. No significant differences in outcome occurred between manipulation in NHS premises and in private premises. No serious adverse events occurred. Conclusions Relative to “best care” in general practice, manipulation followed by exercise achieved a moderate benefit at three months and a small benefit at 12 months; spinal manipulation achieved a small to moderate benefit at three months and a small benefit at 12 months; and exercise achieved a small benefit at three months but not 12 months. This trial compared a class based general exercise programme and a spinal manipulation package with “best care” in general practice, based on “active management.” A previous UK trial reported that treatment by private chiropractors was superior to routine outpatient care,6 but the trial received criticism for not considering the potentially biasing effect of treatment location.7 Therefore, we also compared the effect of manipulation delivered in private premises with that of manipulation in premises owned by the NHS. Our main aim was to estimate, for patients consulting their general practitioner with back pain, the effectiveness of adding the following to best care in general practice8: a class based exercise programme (“back to fitness”),9 a package of treatment by a spinal manipulator (chiropractor, osteopath, or physiotherapist),10 or manipulation followed by exercise. We also aimed to test whether the manipulation package was more or less effective in manipulators' private premises than in NHS premises. We selected 14 centres, including two for the feasibility study. All centres had general practices from the Medical Research Council (MRC) General Practice Research Framework (mrc-gprf.ac.ukq), with a total of at least 40 000 registered patients within travelling distance of treatment locations for manipulation and exercise; two manipulators (chiropractors, osteopaths, or physiotherapists) with private premises, willing to work in NHS premises, with colleagues to cover absences; a physiotherapist to deliver the exercise programme, with a colleague to cover absences; NHS premises in the community suitable for spinal manipulation; and premises in the community suitable for exercise classes. Like other evidence based guidelines,13 the UK national acute back pain guidelines advise continuing normal activities and avoiding rest.2 To maximise recruitment and base the comparator treatment on these guidelines,11 we invited clinical and support staff from all participating practices to training sessions on the “active management” of back pain.8 We also provided copies of The Back Book,14 the corresponding patient booklet, for practice reception areas and for patients with back pain. We defined “basic minimum treatment” as initial assessment plus one class for exercise and as two sessions, including assessment, for manipulation. Exercise programme—We developed the exercise programme (“back to fitness”9) from previous trials.15 16 It comprises initial individual assessment followed by group classes incorporating cognitive behavioural principles. We trained physiotherapists with at least two years' experience since qualification to deliver this programme. Classes ran in local community facilities. Up to 10 people took part in each session. We invited participants to attend up to eight 60 minute sessions over four to eight weeks and a “refresher” class 12 weeks after randomisation. Spinal manipulation package—A multidisciplinary group developed a package of techniques representative of those used by the UK chiropractic, osteopathic, and physiotherapy professions.10 The three professional associations agreed to the use of this package in this trial. Similar numbers of qualified manipulators from each of these professions treated participants. They all had a minimum of two years' clinical experience and were skilled in a range of manipulative techniques, including high velocity thrusts.10 Participants randomised to private manipulation received treatment in manipulators' own consultation rooms. Those randomised to NHS manipulation saw the same manipulators in NHS premises. Following initial assessment, manipulators chose from the agreed manual and non-manual treatment options. They agreed to do high velocity thrusts on most patients at least once. We invited participants to attend up to eight 20 minute sessions, if necessary, over 12 weeks. Combined treatment—We invited participants to attend eight sessions of manipulation over six weeks, eight sessions of exercise in the next six weeks, and a refresher class at 12 weeks. Other aspects of treatment were identical to those in the manipulation only or exercise only groups. Participants completed questionnaires on general health, back pain, beliefs, and psychological wellbeing before randomisation and at one, three, and 12 months thereafter. The research team monitored serious adverse events, defined as treatment related events leading to hospital admission or death within one week. Questionnaires (table 1) included two back specific instruments—the Roland Morris disability questionnaire and the modified Von Korff scales,17 18 two measures of belief—the back beliefs questionnaire and the fear avoidance beliefs questionnaire,19 20 and two generic measures—the SF-36 and the EuroQol,21 22 reported in the accompanying economic paper.23. After consenting participants had completed baseline assessments, nurses contacted the remote randomisation service. This stratified participants by practice and allocated them between the six groups in figure 1 by randomly permuted blocks. In the feasibility study participants were allocated between the six groups in equal proportions. In the main trial one quarter of participants were allocated to each of four groups—“best care” in general practice, best care plus exercise, best care plus manipulation, and best care plus manipulation and exercise; participants due to receive manipulation were then subdivided equally between NHS and private settings (fig 1). Nurses informed participants of their allocations immediately. Alerted by letter, manipulators and exercise physiotherapists contacted participants to arrange their first appointments. As UK BEAM was a pragmatic trial to estimate the effectiveness of manipulation and exercise in routine clinical practice, blinding of participants and professionals was neither desirable nor possible. 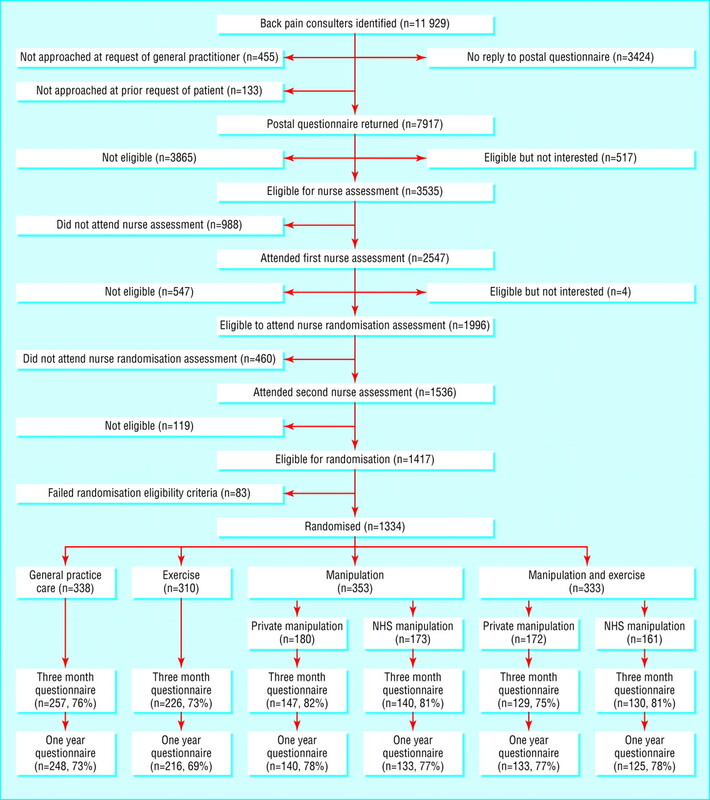 We used two sided significance tests to analyse the primary outcome—Roland disability questionnaire score after three or 12 months—by intention to treat. We used analysis of covariance to adjust this score for centre and baseline score. We analysed the data in steps. Firstly, we used multilevel modelling to make allowance for the innate clustering of participants by centre, exercise class, manipulator, and practice. Secondly, we tested the effect of exercise without manipulation by comparing participants allocated to best care with those allocated to best care plus exercise (table 2). Thirdly, we tested the effect of manipulation without exercise by comparing participants allocated to best care with those allocated to best care plus manipulation (table 3). If this was significant, we tested for differences between manipulation in NHS and private premises. Finally, if either exercise or manipulation gave significant results, we tested for interactions between exercise and manipulation—that is, whether the estimated improvement in participants allocated to best care, manipulation, and exercise (table 4) differed significantly from the sum of the estimated improvement due to manipulation (table 3) and that due to exercise (table 2). Of the 14 effects of combined treatment estimated in table 4, most were larger but not much larger than the corresponding estimates for exercise only (table 2) or manipulation only (table 3). Indeed, only that relating to back beliefs at 12 months was larger than the sum of the corresponding estimates for the individual treatments in tables 2 and 3. So participants who have already received manipulation apparently get less benefit from exercise than do those who have not received manipulation. Rather than ascribe a significance level to these 14 correlated findings, we report that at three months the interaction between manipulation and exercise in their effect on disability scores was just significant at the 5% level; the standardised regression coefficient was 1.0 (95% confidence interval 0.0 to 2.1). At 12 months, however, the corresponding interaction was not significant; the standardised regression coefficient was 0.1 (−1.0 to 1.2). Nevertheless, to avoid underestimating the effect of treatment, we estimated that of exercise as in the second step and that of manipulation as in the third step. Because correlation within clusters proved smaller than projected,11 multilevel modelling generated estimates and confidence intervals very similar to those generated by the simpler analysis of covariance (tables 2 and 3). We present the simpler estimates here. We recruited 1334 participants from 181 general practices around 14 centres across the United Kingdom (fig 1). These practices were broadly typical of UK practices in size and deprivation. The feasibility study recruited 164 participants between March 1998 and April 1999.11 The main trial recruited 1170 participants between August 1999 and April 2001. These participants attended exercise classes in 18 community settings and received manipulation in 45 premises, 27 private and 18 owned by the NHS. At three months, 1029 (77%) returned questionnaires; at 12 months, 995 (75%) returned questionnaires. Responders were much more likely than non-responders to be female, above average age, and educated beyond age 16 and to have had severe back pain at randomisation. As these trends were consistent across randomised groups, however, little risk of bias exists. The mean (SD) age of participants at randomisation was 43 (11) years; 56% were female, and 9% were not working because of poor health. More than half had had pain for more than 90 days. Mean (SD) Roland disability score at randomisation was 9.0. The six randomised groups had similar characteristics (table 1). The message about active management reached most participants: when asked at randomisation, 1160 (87%) recalled seeing The Back Book.14 Of 686 participants allocated to manipulation, 633 (92%) received “basic minimum treatment.” Of 643 participants allocated to exercise, 408 (63%) received basic minimum treatment. No serious adverse events occurred. Roland disability questionnaire scores improved by a mean (SD) of 3.3 (4.5) points at three months and 3.5 (4.7) points at 12 months. Figure 2 shows progress in disability scores following randomisation between the four basic interventions. Exercise produced statistically significant improvements in mean Roland disability score at three months only (difference = 1.4; 95% confidence interval 0.6 to 2.1), in mean Von Korff disability and pain scores and back beliefs score at both three and 12 months, and in mean SF-36 physical score and fear avoidance beliefs physical score at three months only (table 2). Mean SF-36 mental score did not differ. Manipulation produced statistically significant improvements in Roland disability scores at three months (1.6; 0.8 to 2.3) and at one year (1.0; 0.2 to 1.8); in mean Von Korff pain score, back beliefs score, and SF-36 physical score at both three and 12 months; in mean Von Korff disability score at 12 months only; and in mean SF-36 mental score at three months only (table 3). Mean fear avoidance beliefs physical score did not differ. We found no significant differences between the outcome of manipulation delivered in NHS or private premises. The adjusted difference in disability scores was 0.2 (−0.6 to 0.9) in favour of private premises at three months and 0.1 (−0.7 to 0.9) in favour of NHS premises at 12 months. Manipulation followed by exercise produced significant improvements in Roland disability scores at three months (1.9; 1.2 to 2.6) and at one year (1.3; 0.5 to 2.1); in mean Von Korff disability and pain scores and back beliefs, fear avoidance beliefs, and SF-36 physical scores at both three and 12 months; but in mean SF-36 mental score only at three months (table 4). Three of these 13 significant improvements were significantly greater than the corresponding improvements from manipulation without exercise—in fear avoidance beliefs scores at three and 12 months and back beliefs scores at 12 months. The “back to fitness” programme led by physiotherapists encourages participants to increase their physical activity in a socially supportive milieu. At three months, participants randomised to this programme reported significant improvements in the primary functional outcome measure (Roland disability score) and several secondary outcomes—disability and pain, back beliefs, fear avoidance, and general physical health. Their mean improvement in disability score was equal to 35% of the population standard deviation—a “standardised difference” of 0.35. At 12 months, they maintained their reductions in disability and pain in full, and their improved beliefs about back pain in part, but not their other improvements, notably in Roland disability scores. At three and 12 months, participants randomised to the spinal manipulation package delivered by chiropractors, osteopaths, and physiotherapists reported significant improvements in Roland disability scores and several secondary outcomes—pain, back beliefs, and general physical health. Their disability scores improved by a standardised difference of 0.39 at three months and 0.25 at 12 months. They also reported improved mental health at three months, and improved disability at 12 months. These benefits did not differ between NHS and private premises. This trial examined the pragmatic question of how general practitioners should manage patients with back pain that does not resolve spontaneously. The patients of nearly 200 participating general practices were broadly typical of the United Kingdom. As we randomly allocated manipulators delivering therapy between their own and NHS premises, the absence of any difference in outcome answers some of the criticisms of the previous MRC trial of chiropractic.6 7 Thus the effectiveness of manipulation may not depend on location. The nature of the “comparator” treatment may have limited the size of our positive findings. By training volunteer general practices in the active management of back pain,8 and providing trial participants with a copy of The Back Book,14 we were using “best care” in general practice as the comparator, thus reducing the opportunities for additional improvement. That only 63% of participants allocated to the exercise programme received “basic minimum treatment” may have reduced its effectiveness. We cannot be sure whether limiting the treatments available to manipulators reduced or enhanced their effectiveness. The Roland disability questionnaire comprises 24 items designed to measure functional disability due to back pain, including walking, bending, sitting, lying down, sleeping, dressing, self care, and other daily activities.17 Each item contributes one point to the total score. We found that exercise enabled participants to perform an average of 1.4 additional personal functions at three months, manipulation generated 1.6 additional personal functions at three months and 1.0 at 12 months, and combined treatment generated 1.9 additional personal functions at three months and 1.3 at 12 months. Thus exercise improves back function by a small, but statistically significant, margin at three months; it also achieves sustained reductions in disability and pain, and in adverse beliefs about back pain. Manipulation improves back function by a small to moderate margin at three months and a small but significant margin at 12 months; it also achieves sustained improvements in disability and pain, adverse back beliefs, and general physical health. Combined treatment improves back function by a moderate margin at three months and a small but significant margin at 12 months; generally it achieves little more than manipulation, except for much greater improvements in beliefs about back pain and fear avoidance. We thank all participants—patients, primary care staff, and the collaborators listed on bmj.com—for their contributions. Members of the UK BEAM Trial Team: Ian Russell, Martin Underwood, Stephen Brealey, Kim Burton, Simon Coulton, Amanda Farrin, Andrew Garratt, Emma Harvey, Louise Letley, Andrea Manca, Jeannett Martin, Jennifer Klaber Moffett, Veronica Morton, David Torgerson, Madge Vickers, Ken Whyte, Melanie Williams. Contributors SB has been assistant trial manager at the York coordinating centre since August 2000. He contributed to collecting, validating, analysing and interpreting data, and drafting this paper. KB was a member of the MRC Back Pain Working Party, participated in the design and implementation of the trial, and was a member of the group that developed the spinal manipulation package. As joint national clinical coordinator, he was responsible for gaining the collaboration of the osteopathic profession in delivering this package and for implementing the resulting programme across the United Kingdom. He contributed to drafting this paper. SC was trial data manager, responsible for designing and implementing the data management plan and verifying and validating data. He contributed to implementing the trial design, developing and implementing randomisation procedures, developing questionnaires and other data collection instruments, analysing and interpreting data, and drafting this paper. AF was trial statistician, responsible for designing and implementing the analysis plan and validating data statistically. She contributed to implementing the trial design, developing and implementing randomisation procedures, developing questionnaires and other data collection instruments, analysing and interpreting data, and writing this paper. AG was a member of the MRC Back Pain Working Party, participated in the design and implementation of the trial, and was responsible for the evaluation and selection of the patient assessed health instruments. He contributed to developing questionnaires, analysing and interpreting data, and drafting this paper. EH was trial manager at the York coordinating centre, responsible for establishing and maintaining the 14 treatment centres and recruiting clinical advisers and local coordinators. She contributed to development and delivery of training in active management, implementing the “back to fitness” exercise programme, the spinal manipulation package, and the trial design; developing questionnaires and other materials; collecting, analysing, and interpreting data; and writing this paper. LL supervised the activities of practice based research nurses and coordinated nurse training. She contributed to implementing the trial design, selecting and recruiting practices for the trial, developing trial documentation including standard operating procedures, and drafting this paper. AM has been assistant trial economist since April 2002, responsible for designing and implementing the economic analysis plan. He estimated unit costs, analysed and interpreted economic data, and contributed to drafting this paper. JM had overall responsibility for all nursing activity within the trial including training and quality control through the GPRF regional training nurses. She contributed to implementing the trial design, selecting and recruiting practices, trial documentation including standard operating procedures, and drafting this paper. JKM was a member of the MRC Back Pain Working Party, participated in the design and implementation of the trial, contributed to the original grant application, and acted as grant holder responsible for physiotherapy within the trial. She developed the “back to fitness” exercise programme and was a member of the group that developed the spinal manipulation package. As joint national clinical coordinator, she was responsible for gaining the collaboration of the physiotherapy profession in both the exercise programme and the manipulation package and for implementing the exercise programme across the United Kingdom. She contributed to drafting this paper. VM has been assistant trial statistician since April 2002. She contributed to validating, analysing, and interpreting data and drafting this paper. IR was a member of the MRC Back Pain Working Party, participated in the design and implementation of the trial, was primarily responsible for the original grant application, and acted as grant holder and principal investigator in York. He chaired the trial management group and contributed to analysing and interpreting data and to writing this paper. He guarantees its statistical content. DT was trial economist, responsible for designing and implementing the economic evaluation and validating economic data. He contributed to implementing the trial design, developing questionnaires and other data collection instruments, analysing and interpreting data, and drafting this paper. MU was a member of the MRC Back Pain Working Party, participated in the design and implementation of the trial, contributed to the original grant application, and acted as grant holder responsible for medical aspects of the trial. He was trial manager at the London coordinating centre until October 1999, then joint national clinical coordinator. He contributed to developing questionnaires and developing other data collection instruments, the development and delivery of the training in active management, recruiting practices and participants, following up participants, managing, analysing and interpreting data, and writing this paper. He guarantees its clinical content. MV was a member of the MRC Back Pain Working Party, participated in the design and implementation of the trial, contributed to the original grant application, and acted as grant holder and principal investigator in London, responsible for recruiting practices and participants, and following up participants. She contributed to analysing and interpreting data and drafting this paper. KW has been trial manager at the London coordinating centre since October 1999. He was responsible for monitoring participant recruitment and for patient and practice based follow up procedures. He contributed to drafting this paper. MW was assistant trial manager at the York coordinating centre until August 2000 and acted as trial manager from then until April 2001. She was responsible for maintaining the 14 treatment centres, recruiting and training local coordinators, managing NHS treatment costs, and collecting and validating data. She contributed to drafting this paper. Funding Medical Research Council (research costs); National Health Service in England, Northern Ireland, Scotland, and Wales (excess treatment and service support costs). The MRC established a trial steering committee to advise the grant holders and trial team on trial design; the collection, analysis, interpretation; and writing up of data; and publication policy. Competing interests LL, JM, MU, MV, and KW have received salaries from the MRC. MU has received fees for speaking from Menarini Pharmaceuticals, the manufacturers of dexketoprofen and ketoprofen, and Pfizer, the manufacturers of celecoxib and valdecoxib. The other 12 authors have nothing to declare. Ethical approval The Northern and Yorkshire multicentre research ethics committee and 41 local research ethics committees approved the trial protocol. Amendment This is Version 2 of the paper. In this version, fig 1 has been amended so that the “manipulation” groups are correctly divided into “private manipulation” and “NHS manipulation” [in the previous version, all subgroups were labelled “private manipulation]. .The economic burden of back pain in the UK.Pain2000; 84:95–103. .Low back pain evidence review.London:Royal College of General Practitioners,1999. .Conservative treatment of acute and chronic nonspecific low back pain: a systematic review of randomized controlled trials of the most common interventions.Spine1997; 22:2128–56. .Spinal manipulative therapy for low back pain: a meta-analysis of effectiveness relative to other therapies.Ann Intern Med2003; 138:871–81. .Exercise therapy for low back pain: a systematic review within the framework of the Cochrane Collaboration Back Review Group.Spine2000; 25:2784–96. .Low back pain of mechanical origin: randomised comparison of chiropractic and hospital outpatient treatment.BMJ1990; 300:1431–7. .Effectiveness of chiropractic and physiotherapy in the treatment of low back pain: a critical discussion of the British randomized clinical trial.J Manipulative Physiol Ther1991; 14:281–6. .The acceptability to primary care staff of a multidisciplinary training package on acute back pain guidelines.Fam Pract2002; 19:511–5. .Back to fitness programme: the manual for physiotherapists to set up the classes.Physiotherapy2000; 85:295–305. .Spinal manipulation for low back pain: a treatment package agreed by the UK chiropractic, osteopathy and physiotherapy professional associations.Man Ther2003; 8:46–51. .UK back pain exercise and manipulation (UK BEAM) trial—national randomised trial of physical treatments for back pain in primary care: objectives, design and intervention.BMC Health Serv Res2003; 3:16. .The qualification period.J Clin Epidemiol1991; 44:461–4. .Clinical guidelines for the management of low back pain in primary care.Spine2001; 26:2504–14. .Randomised controlled trial for evaluation of fitness programme for patients with chronic low back pain.BMJ1995; 310:151–4. .Randomised controlled trial of exercise for low back pain: clinical outcomes, costs, and preferences.BMJ1999; 319:279–83. .A study of the natural history of back pain. I: development of a reliable and sensitive measure of disability in low-back pain.Spine1983; 8:141–4. .Evaluation of two time-specific back pain outcome measures.Spine1999; 24:1104–12. .Do attitudes and beliefs influence work loss due to low back trouble?Occup Med1996; 46:25–32. .A fear-avoidance beliefs questionnaire (FABQ) and the role of fear-avoidance beliefs in chronic low back pain and disability.Pain1993; 52:157–68. .The MOS 36-item short-form health survey (SF-36). I: conceptual framework and item selection.Med Care1992; 30:473–83. .EuroQol—a new facility for the measurement of health-related quality of life.Health Policy1990; 16:199–208. .United Kingdom back pain exercise and manipulation (UK BEAM) randomised trial: cost effectiveness of physical treatments for back pain in primary care. BMJ 2004;329:doi:10.1136/bmj.38282.607859.AE. .Minimal clinically important difference in low back pain outcome measures.J Rheumatol2001; 28:431–8.